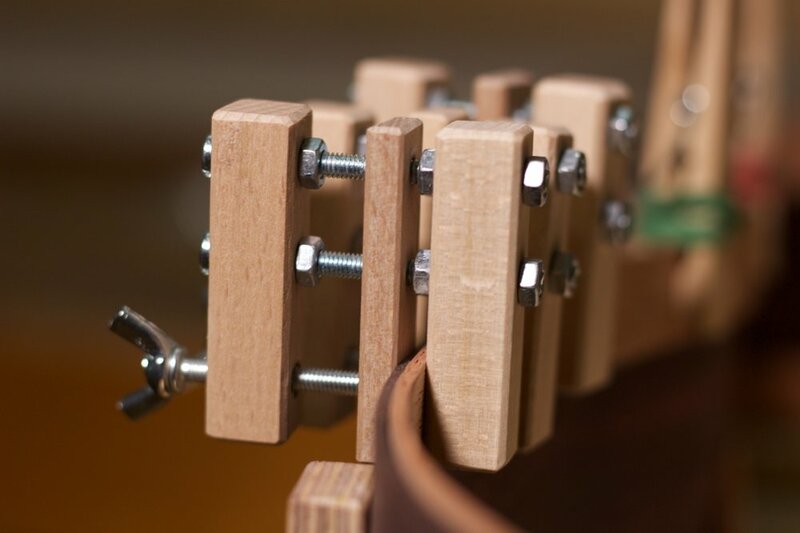 Here is a collection of photos from the gluing of the bridge and the first coats of shellac on a new guitar that I’ll be sending to Galerie des Luthiers in Lyon, France in about a month. I’m extremely happy with how this guitar is coming along! I was able to string up this new 640mm scale length Torres/Romanillos model last weekend thanks to a surprise Saturday delivery from Scheller! I decided to go a bit more Romanillos than Torres on this guitar if that makes any sense. What I mean, is that I stiffened up the overall construction a bit more that usual to help with the treble response of the instrument, particularly considering the shorter scale. I feel that it helped even out the sustain and decay of notes on the first string and provide more clarity and range. It is, however, still a relatively lush and deep sounding instrument with a low body resonance just above F#. 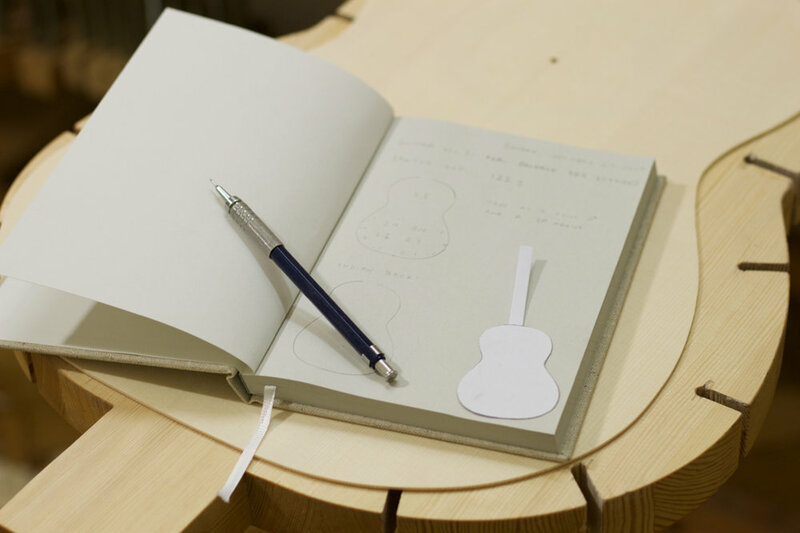 I was given a fancy new notebook to record guitar data with my name on it for my birthday this year. 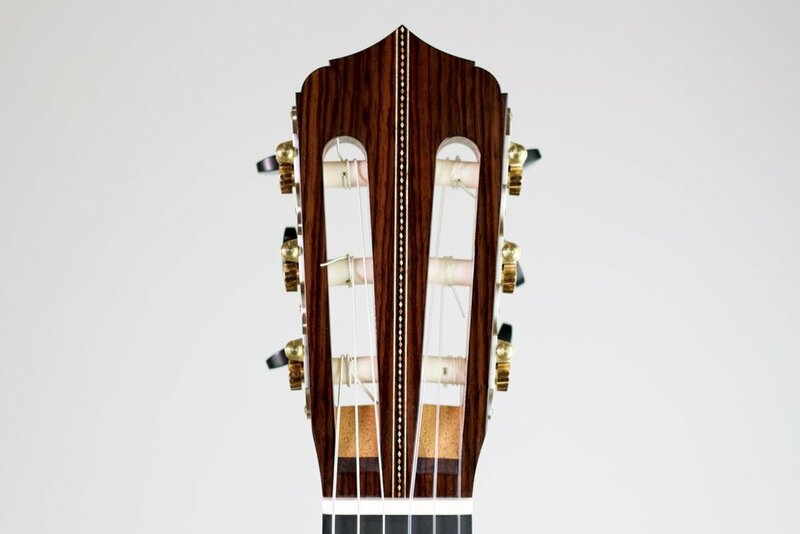 I was excited to put in the first entry today after making some progress on the latest Torres/Romanillos model that I’ll be sending to Galerie des Luthiers in Lyon, France. Here are some progress photos from the making of all the parts. 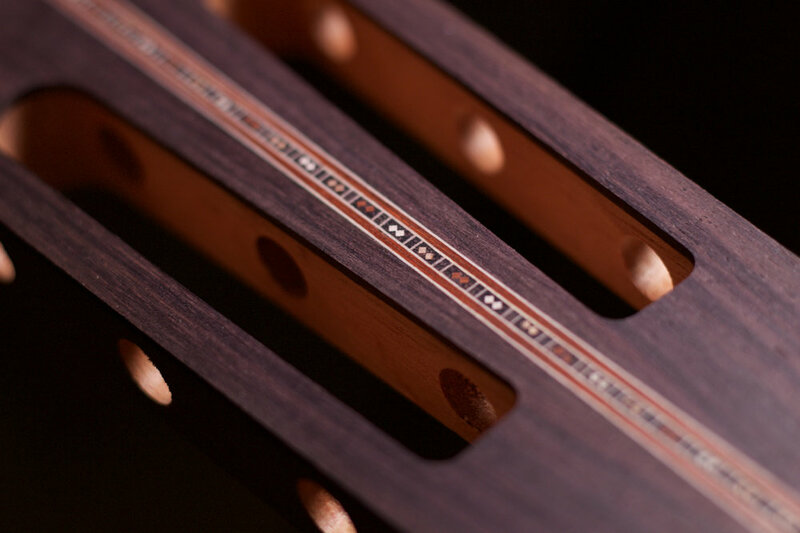 Roughed-out neck blank, head stock with v-joint, rosette with a new lozenge exterior motif and the top and back plates planed to final thickness. I’m one of dwindling number of luthiers still planing all their backs and sides by hand, so I feel like I gotta take some photos and romanticize the whole thing a bit! I just got the new Crossrock cases in stock. They've made some thoughtful improvements to previous designs that I think are pretty good. Send me an email if you are in the area and want to check them out. 2.95 kilos, well padded, spring-loaded latches and TSA lockable latch, leather handle. Comes with backpack straps with carabiner hooks. Better latches than before, nicer leather handle, hygrometer is on the bottom instead of the top where it used to be, which I think is a big improvement. Comes with backpack straps. These are more rigid and, I think, much better overall than the Eastman or similar fiberglass cases that have been on the market for a while now. I recently met with a friend for coffee and while we were talking about a new rosette that I had recently posted photos of, she asked me in a general sort of way, “what do these rosettes mean?” I often lose perspective during the innumerable hours that I spend thinking about and making these tiny things, that I forget how little any normal person even notices them. So, I thought that it might be interesting to give more of an explication of the current rosette that I’m working on in addition to the usual pictures. 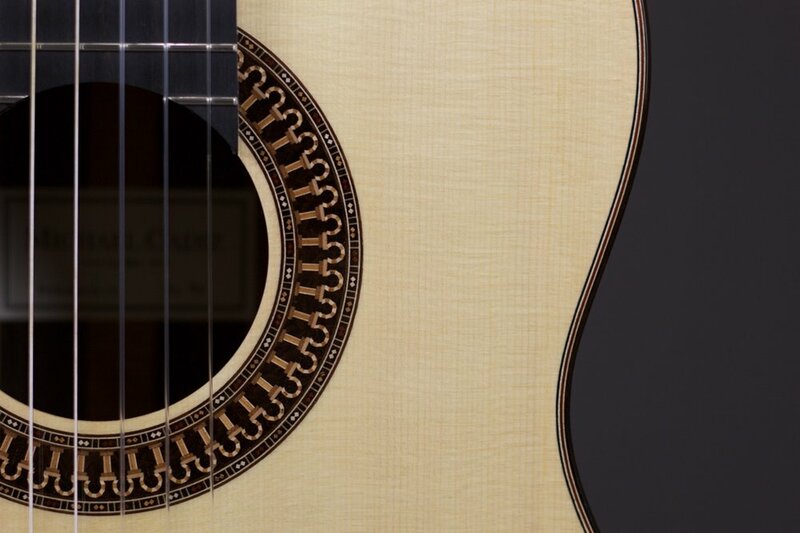 I’d eventually like to write more of an in-depth article about the broader subject of marquetry in musical instruments, but that will have to remain a long-term goal for now. 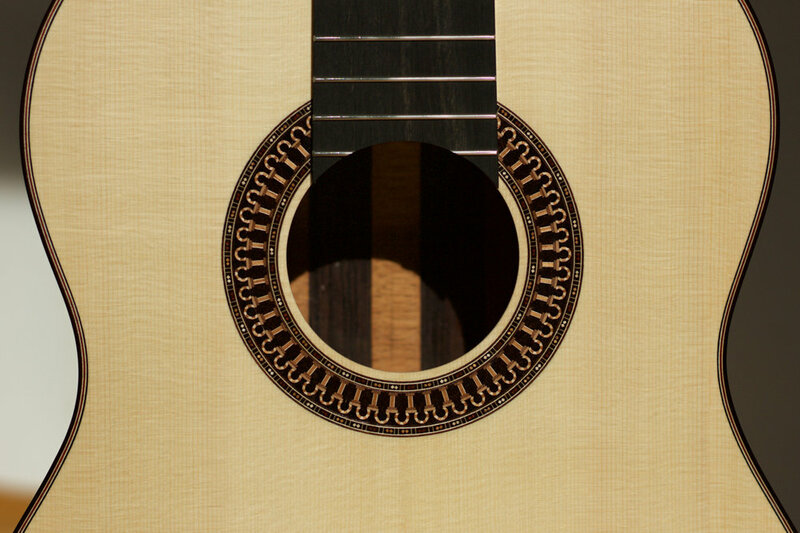 The rosette that I’m working on at the moment was designed by the famous Spanish guitar maker José Romanillos. It’s one of the more iconic and it easily recognizable rosettes I’ve ever seen. 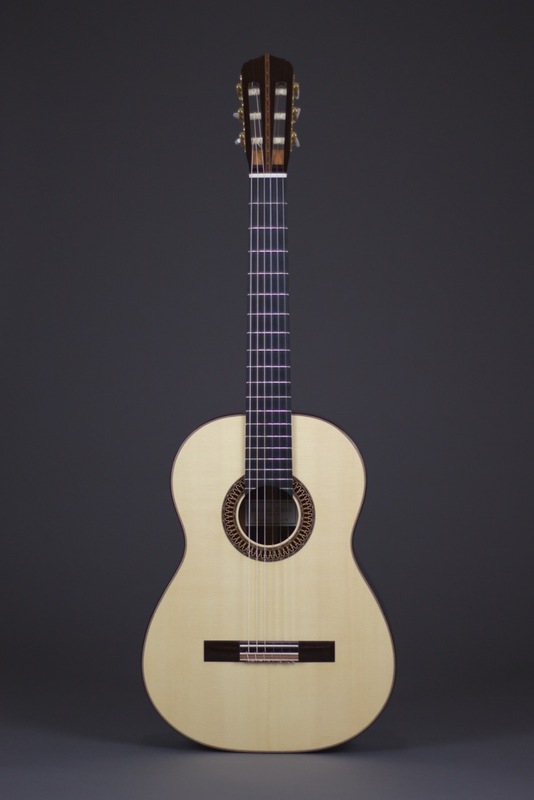 I grew up studying the classical guitar and I honestly never paid much attention to how any guitar looked, but I remember this rosette striking me immediately; I would check out VHS tapes from the library of Julian Bream performing and I remember thinking about how unusual and beautiful the rosette on his guitar looked. Like many rosettes, it consists of a interior band made up of a repeating mosaic pattern. It’s the visual focus of the rosette and sometimes even pictorial. 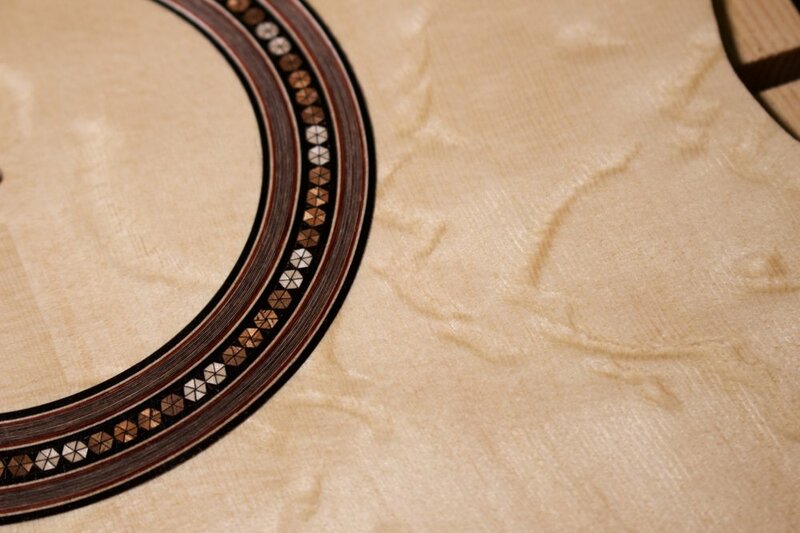 The two surrounding bands are almost always symmetrical and feature a series of veneer lines and sometimes a more subtle and abstract marquetry pattern. The Romanillos rosette is no exception. However, the technique is unusual and creates a striking result. It consists of a series of columns and horseshoe arches (also known as Moorish arches). It was inspired by the Muslim prayer hall in the famous Mosque or Mezquita-Cathedral in Cordoba, Spain. In the 8th century CE under Abd ar-Rahman, the Umayyad Caliphate expanded through much of Iberia, including the Visigoth Kingdom where the Emirate of Cordoba was subsequently established. The current structure of the mosque is, supposedly, built in place of what once was church where both Christians and Muslims worshiped. It’s believed that Abd ar-Rahman purchased the christian portion, leveled the whole structure and built the giant mosque in its place. The mosque has since been converted into a Catholic church and Muslims are currently barred from worshiping inside it. As a person with no official religious affiliations, I find it interesting and beautiful in an historic and artistic sort of way. The outer rings of my current version of this rosette feature a few simple lines of rosewood, sycamore, walnut and padouk. Romanillos was quite vocal about his aversion to artificially dyed woods, so I don’t use any in trying to keep with the spirit. His rosettes in the 70’s were narrower and eventually grew to over 20mm wide in the 80’s and 90’s with more elaborate herringbone and lozenge motifs in the outer rings. I like to keep my rosettes at a maximum of 19mm these days as I feel that they start to look cumbersome beyond that. Anyway, that is a brief explanation the Romanillos rosette. I’ve included some photos through the process as well as some of the Mezquita-Cathedral. For interested woodworkers, Romanillos explains and documents much of the building process in his recently published book which you can purchase from him and his wife Marian directly. I recently took some time out of my normal schedule to design a new rosette. Over the years, I’ve mostly been making rosettes inspired by Torres, Hauser and Romanillos. I’ve been wanting come up with an original design that I could really call my own, but it’s always difficult to design something new that both shows an amount of skill and is also tasteful. I feel like this new rosette balances the two quite well and, at the same time, includes some of the techniques and proceedures that I’ve learned over the years paying tribute to other builders. Here is a short collection of photos backwards through the building process. The hexagonal interior mosaic motif made up of tiny triangles of maple, walnut and Spanish cedar; the technique is quite similar to how Romanillos makes his arches rosette. The three woods are planed to a specific thickness and then laminated with a hand-planed 0,1mm thick black veneer. The pieces are oriented so that the subsequent triangles show face-grain which has a clear and reflective quality to it. For this motif, I was originally inspired by looking at an old book of patterns collected by 19th century architect Owen Jones who had spent much time documenting mosaic patterns at the famous Alhambra palace in Granada. I wanted to include more of the complex and random nature of the patterns, but it quickly became to busy and didn’t quite work as a rosette. 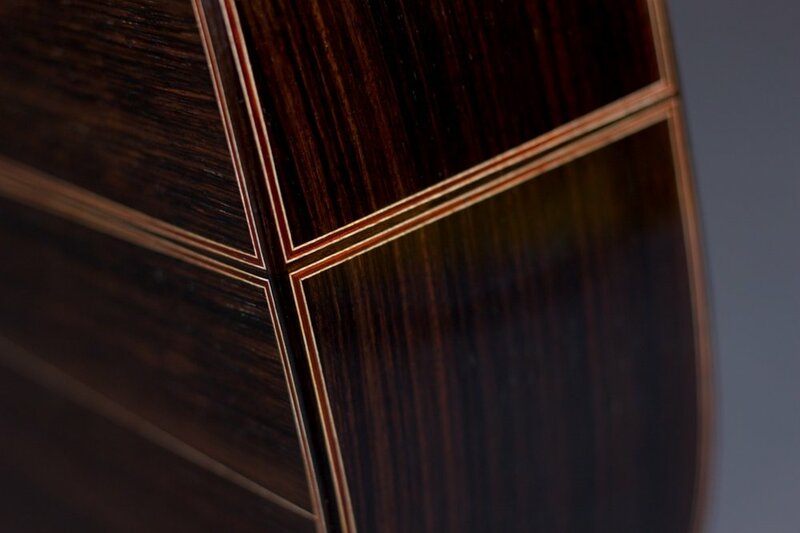 The exterior motif made up of various veneer lines of ebony, padouk, rosewood and beech. 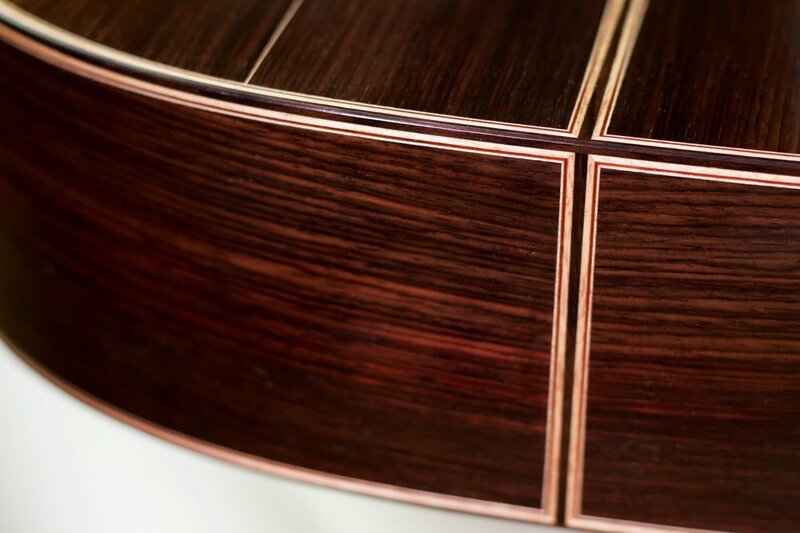 The middle lamination is made up of 20 hand-planed birch and rosewood veneer strips. They are ironed flat, glued together and then cut into strips. This requires a very sharp plane, good eyesight and some trouble-shooting to avoid all of the 0,1mm thin strips from immediately curling up and wrinkling from the moisture of the glue. The result is subtle from a normal distance and dizzying from up close.